At the SQL Server Instance step of the wizard, choose a Microsoft SQL Server instance that will host the Veeam ONE database. If you are installing Veeam ONE Server and Veeam ONE Web UI on different machines, make sure that both components share a common database. The Microsoft SQL Server selection differs based on the choice of Veeam ONE components. If you are installing Veeam ONE Server or a combination of Veeam ONE Server and Veeam ONE Web UI, you must select Microsoft SQL Server as follows. If you do not have a Microsoft SQL Server instance that you can use for Veeam ONE, select the Install new instance of SQL Server option. If a SQL Server instance that meets Veeam ONE system requirements is detected on your machine, you can only use the existing local SQL Server instance or choose the one that runs remotely. The option to install a new SQL instance will be unavailable in this case. If you intend to use an existing local or remote Microsoft SQL Server instance, select the Use existing instance of SQL Server option and choose a local Microsoft SQL Server instance or browse to a Microsoft SQL Server instance running remotely. You can enter the address of the preferred Microsoft SQL Server manually or use the Browse button to choose among available remote instances. 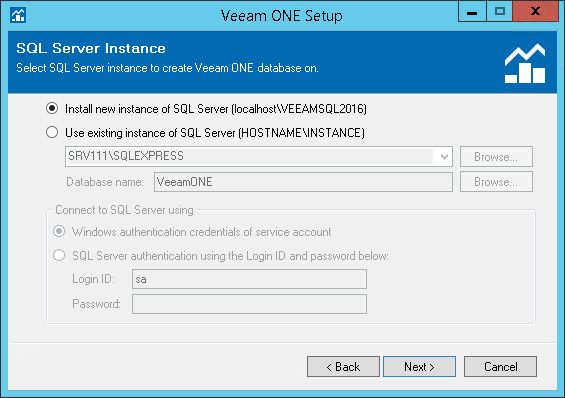 If you already have an existing Veeam ONE database that you want to use in your deployment, select the Use existing instance of SQL Server option and choose the Microsoft SQL Server instance that hosts the database. This can be a database that you have previously created with a SQL script. In the Database name field, specify the name of the database. Provide credentials for the account that will be used by Veeam ONE components to access the database. You can enter credentials explicitly or use Windows authentication credentials of the service account to connect to the Microsoft SQL Server. For details on required permissions for the account, see Connection to Microsoft SQL Server. If you are installing the Veeam ONE Web UI component only, you must point to the existing Veeam ONE database. This must be Veeam ONE 9.5 Update 4 database that was created when you installed the Veeam ONE Server component, or the database that you created with a SQL script. In the Specify Veeam ONE database SQL Server field, choose a Microsoft SQL Server instance that hosts the existing Veeam ONE database. You can type the address of the preferred Microsoft SQL Server manually or use the Browse button to choose among the available remote instances. In the Database name field, specify the name of the existing database or use the Browse button to choose the database from the list. 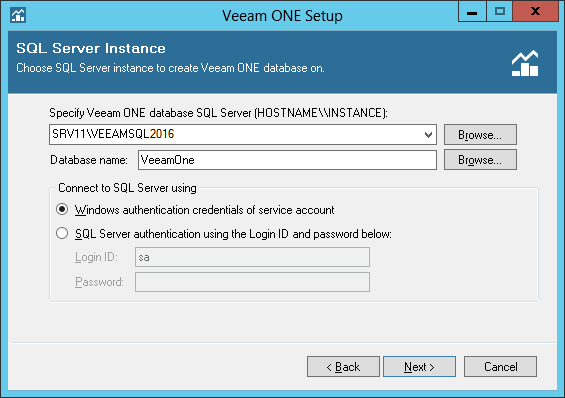 In the Connect to SQL Server using section, provide credentials for the account that will be used by Veeam ONE components to access the database. You can specify credentials explicitly or use Windows authentication to connect to the Microsoft SQL Server. For details on required permissions for the account, see Veeam ONE Service Account.